Pinch and a punch it's the first of the month. Happy first of November. I know, I know it was Halloween last night but I still have a few cards to share with you. This little Saturated Canary vampire image is called 'My Bite is Worse than His Bark'. I coloured it with Promarkers and mounted it on some mirri card and some purple pearlised card from my stash. 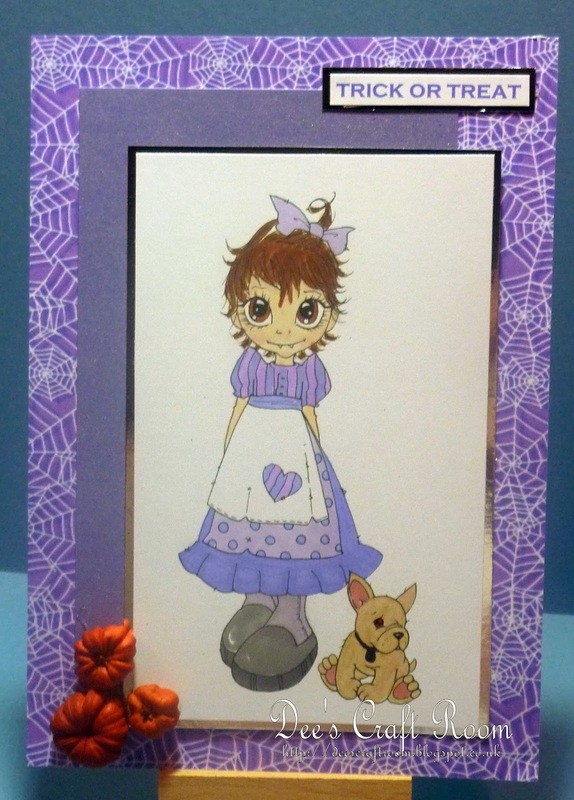 The beautiful lacy spiders web backing paper is a freebie from Crafticious - I love this purple colour. My thanks to my good friend Lisette for the fabulous little pumpkins. So glad you have more cards. I buzzed over just in case so am very happy to see this beautiful creation. Love the purples and the mini pumpkins look fab with it. Only 3 lots of callers last night which leaves a mega amount of chocolate to eat!! !